his is my new band, with Ernst (me) from The Gods Hate Kansas, Erica from Vida and Scott from American Steel. This CD has 5 songs on it, and I think it's the best sounding recording I've ever made. We play a pretty wide range of punk styles with male and (lovely) female vocals. The songs have funny names, and we act silly a lot, but that doesn't mean it's not serious. I'd like to think that we reflect the rich contradictions inherent in life and society. This CD is extra good because it's yellow. t's here! 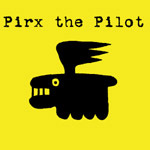 11 songs of unpredictable structuralist punk rock from Pirx the Pilot. Lovely female vocals, dead-on drumming and ernst. This album has been rated anywhere from 10 to 150 times better than our EP, and I agree, though I thought the EP was good too. See Pirx on tour in May! This CD also comes with a CD-ROM with movies. 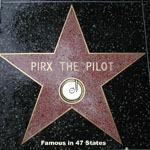 he third album from Pirx the Pilot. This is a whole new sound for the band, with fantastic production and a greater focus on vocals. Songs still range from the punky side of rock to the rock side of punk. 13 songs in 40 minutes. This is another huge step forward for one of the most interesting bands in the bay area. This CD has two videos on it as well.